(next entry) See VisualCAMc for Onshape at the Atlantic Design & Manufacturing 2017! MecSoft attended the Pacific Design & Manufacturing 2017 show in Anaheim, CA on Feb 7-9th, where we demonstrated our CAM on the cloud application at the Onshape Agile Pavilion, Booth #3401. We are calling this product shapeCAM. The name shapeCAM is first and foremost a take on the Onshape name to invoke an association with Onshape since we are partnering with them in our CAM on the cloud initiative. We’ve partnered with Onshape because they are the industry leaders with the first and only fully cloud-based 3D CAD system. Started by the same team that created SOLIDWORKS, Onshape is continuing to gain momentum and market share, and they are on the path to fundamentally reshape the CAD industry. The name Onshape itself is designed to convey the image of a product that is “on” all the time and is used to design any shape that is conceived by the user. Secondly, the name shapeCAM should also connote in users’ minds that idea that this product is designed to be a CAM product for all types and kinds of design shapes. Shapes not just designed in Onshape but even shapes imported in from other design sources. shapeCAM in its current incarnation is a fully cloud-based companion application to Onshape that allows the user to create 2 ½ Axis and 3 Axis milling cutter paths for Onshape part files. This product leverages the production tested and proven manufacturing capabilities of MecSoft’s desktop based VisualCAM product running remotely across the internet on a server. A brand new browser-based user interface allows this product to be used from any device, anytime and from anywhere in the world. By utilizing the design collaboration functionality built into Onshape, this product enables efficient and error free communication between Onshape and shapeCAM. Currently, the product is in Alpha stage. This is programmer-speak for the first phase of development that is ready for testing internally. We are currently preparing this product for the next stage of release, the Beta stage, where we will be inviting end-users to use our product. We expect this to happen in the next 2-3 months. The commercial version of this product, which will include all of the manufacturing capabilities of the desktop VisualCAM product, is slated for release later in the year. When we first announced this product, we met with a lot of skepticism from users of our desktop products. Some of them were quite adamant that they will never use a cloud-based product and we should be spending our resources elsewhere. While we appreciate this point of view, at MecSoft, we believe that the cloud will be a viable alternative platform of choice for customers not just in the CAD industry but also in CAM in the near future. Our view is also that while cloud-based CAM may not be for everyone, there are segments of our user base which will benefit from having our products on the cloud. Educational institutions, students, hobbyists, makers, and casual users will probably be the first to use the cloud-based CAM system due to the accessibility of such systems. As internet connectivity matures and unifies across many parts of the world, and as performance and latency problem of moving large data files across the internet is solved and the internet becomes more secure, cloud-based systems will increase in appeal and will gain more market acceptance. Another trend we think will accelerate this acceptance is the advent of more Millennials into the market. This generation is much more comfortable using cloud-based products and services and will see a cloud-based CAM product as a natural necessity. We are positioning ourselves for the future that is almost here! Stay tuned as we make our announcements about this product by signing up for more information. We will notify you of significant developments with shapeCAM. Additionally, we will be letting those who register be the first to become the universe in which we beta test our new product. 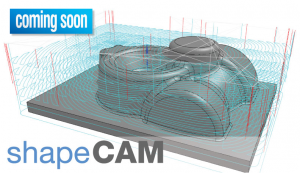 So sign up, buckle up and come along for the ride to cloud-based CAM with us and shapeCAM!